Dethatching, Aeration and Fertilization Services for a healthier, greener lawn! The Danville Lawn: For over 15 years, Barnett Lawn Care has been performing professional Lawn Care in Danville California and the surrounding San Ramon Valley. As lawn care professionals, we have been transforming average looking yards into lawns with the lush healthy green grass that gets the "Wow...I wish our lawn looked like that" comments. We call this the "Danville Lawn". Although such lawns are usually groomed weekly by gardeners, they are actually kept green and healthy by Lawn Care Professionals like us who provide expert services such as dethatching, aeration and lawn fertilization. These are specialized tasks that gardeners are not equipped to perform, and are in fact the "secret" to the plush looking greener lawn we all envy. Creating and maintaining a pristine lawn is a skill that requires experience and a certain unusual passion. A "Danville Lawn" looks like it would be very expensive, but the services we perform are actually very affordable. We have lawn care down to a science, so we know exactly what to do to make your grass greener and keep it that way while charging you far less than others who are less experienced. If you want a green lawn that is the envy of the neighborhood, call Barnett Lawn Care today and get yourself a Danville Lawn! We also service Walnut Creek CA, Alamo and most of the San Ramon Valley, so we can call it a "Walnut Creek Lawn" or an "Alamo Lawn" if you like, but any way you look at it, we are going to make your lawn more lush and green than ever! Below are some of the things that we do to transform your grass into that green lush "Danville Lawn" you've always wanted. Call us today to get the best deal on these regularly scheduled lawn care services. Once you see our results, you will become a loyal customer...we're sure of it. Proper fertilization is the most critical component of professional lawn care and should be done regularly (see our recommended schedule below). We use only the finest quality Turf Royale fertilizer blends to ensure you get the best treatment possible. This high grade fertilizer is used by greens keepers at golf courses around the country because of its outstanding performance. Although it is a bit more expensive than the typical brands sold at home centers, it outperforms anything else we have tried. The Turf Royale Fertilizer mixtures we use contain the 3 main ingredients that are critical for growing healthy green grass: Nitrogen, Phosphate and Potash (lime). The numbers in the fertilizer mixtures represent the percentages of each of the main nutrients. For example: A 21-7-14 fertilizer would be 21% Nitrogen, 7% Phosphate and 14% Potash, which is a great fertilizer for the Fall Months. Your lawn will require different fertilizer mixtures based on seasonal changes and the condition of the grass. The schedule below is typical, but a customized regimen may be needed for your particular lawn. During your initial consultation, your Danville Lawn Care Professional will analyze your lawn and come up with a customized fertilization regimen designed to optimize and maintain your lawn in a healthy state. 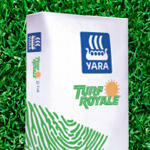 We recommend Turf Royal 21-7-14 fertilizer to promote strong root growth, and deep greening during spring growing season. We also will be offering spring aeration, which promotes deep root growths and saves on water bill, thickening up the lawn and breaks up hard clay. We recommend a special 16-16-16 fertilizer mixture that protects the lawn during hot summer months. We recommend premium lawn food Turf Royal 21-7-14 Fertilizer for maximim growth. Fall months are the best time to perform aeration and dethatching as well as over seeding, which introduces new young plants. Performing these tasks anually is crucial and will have a dramatic impact on the health of your grass. 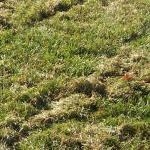 Adding vigor and new life to your lawn at this time will prepare it to weather the upcoming winter months. We recommend Winterizer 6-24-24 fertilizer, which keeps the lawn green during the cold season.This specialized fertilizer mix will help protect your lawn from winter fungus and diseases. 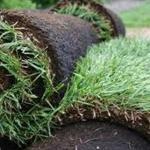 Thatch is the accumulation of grass clippings and debris that gets packed into the ground at the base of your grass. A small layer of thatch is not unhealthy and can actually help your lawn retain moisture. However, too much thatch is unhealthy for your grass. It can prevent water and fertilizer from reaching the roots and makes great food for fungus and grubs, and other pests that love to eat or kill grass. Controlling thatch is essential to the proper health of your lawn and needs to be removed with a dethatching machine periodically. Your Danville Lawn Care Professional will know when dethatching is required and take care of it for you. Lawn aeration is done with a machine that punches holes in the soil and pulls out plugs. This very important process decompacts the soil and allows your grass to breath while promoting stronger growth of the root system. It also provides a way of getting important nutrients deeper into the soil, so it is often followed up by fertilizing and seeding. 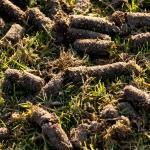 Your Danville Lawn Care Professional will analyze your soil periodically to determine when aeration becomes necessary. A healthy lawn may need more than just fertilizer to reach its maximum potential. There are a myriad of specialized lawn care products designed to promote growth and help maintain healthy nutrition of the soil. 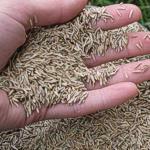 Seeding is particularly necessary for continual growth of new grass and roots. Top dressing is the process of adding an additional soil mixture that is worked into the grass in order to even out lumps and dips in the lawn. Your Danville Lawn Care Professional will inform you when Seeding and/or Top Dressing is required and take care of it for you. No matter what we do to your lawn, proper watering is essential in order to maintain its health. Poorly adjusted sprinklers and broken sprinkler heads can cause uneven growth and patchiness. 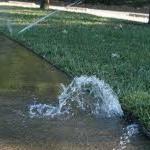 During our initial consultation, we will test your sprinkler system to see if it is sufficient. If it is not, we will make specific recommendations for optimizing or replacing your sprinklers so that they can do their job. We also specialize in the installation of water saving sprinklers. On our regularly scheduled visits, we will inspect your sprinkler system and replace or repair any damaged sprinkler heads and adjust those that are not flowing properly. You will be amazed at how your Danville Lawn Care Professional can transform what appears to be a hopeless lawn into the finest lawn on the block. But there are cases where a lawn is simply irreparable and the soil is in such bad condition that we must start from scratch. In such cases, we provide a complete re-sodding service where we remove the existing grass and top soil and provide new healthy soil and grass either from seed or rolls of turf. We will make this recommendation upon our initial consultation if we find it necessary. We also perform rain gutter and roof cleaning services in Danville and surrounding areas. 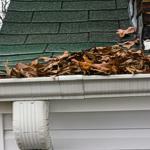 We will remove all debris from your rain gutters and downspouts as well as clean leaves and debris from your roof. Your rain gutters help divert water away from your home, which helps protect your siding, doors and windows, as well as your roof and your foundation. Your rain gutters should probably be cleaned at least once or twice a year, so give us a call before it starts raining so you can be prepared.